It all starts with the initial consultation. 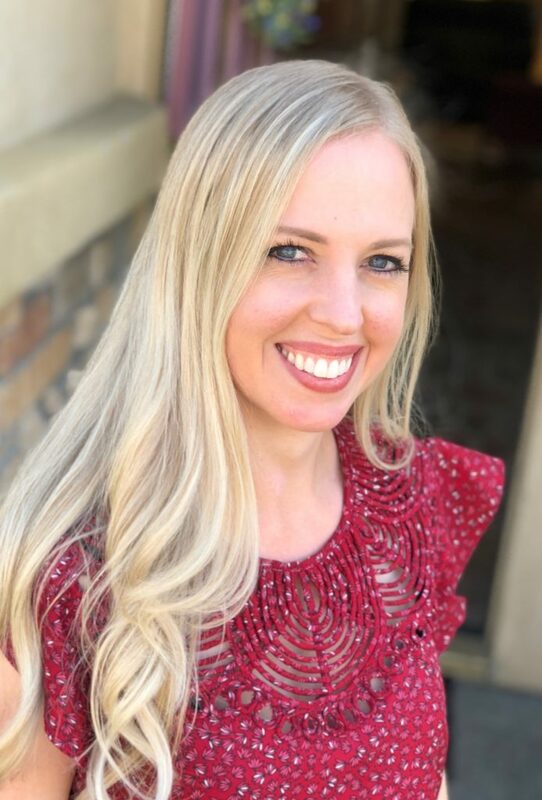 Here at Rebecca Ward Design, we have two consultation options: a Color Consultation and a Project-Starter Consultation. Most of the time, a Color Consultation is a one-time meeting where we select paint colors and/or a color scheme for the home. The Project-Starter Consultation is designed to kick off a new project. Our consultations are more than just a meet and greet, they’re working meetings where we really get the ball rolling. The meeting takes place at the site of the project, and can last up to 2 hours. During the meeting, we’ll not only get a grasp of what work needs to be done, but we’ll also select paint colors, hone in on a design style, sketch layout ideas, discuss budget, and start looking at finish samples. We’ll also review the design process and our contract in that meeting so that everything is 100% clear moving forward. As you can see, a lot of work is done in this meeting, which allows us to get the project started as successfully and efficiently as possible. After the consultation, we’ll gather any more information we need before starting the design process. The better prepared we are, the easier the design process will go. The information we gather at this time often includes measurements of the home, so that we can do furniture layouts and draw up floor plans and elevations. If you’re moving, adding, or taking away an exterior door or window, it also affects Title 24 which means we will have to not only measure the entire house, but also place every door and window on the plans, which, yeah… it can take a while! We’ll also take photos of the existing space for our own reference, and answer any more questions that might need to be addressed before we begin designing. This is when the magic happens. The design step is when we use all of our creative juices to problem solve and create the most beautiful spaces possible. We’ll draw up floor plans, furniture layouts, and elevation drawings, and select finishes, fabrics and all furniture for the project. This is one of our most time intensive steps, typically taking between 6 & 8 weeks. Unsurprisingly, a majority of the design fee budget goes into this step. During this step, we will also schedule a “Trade Day” where all of the contractors and tradespeople involved in the project will come out to visit the project site so that they can provide accurate bids. This step is so important and so much fun! We get to meet with you at our office to present our Design Boards, drawings, and all of the pretty samples we’ve collected for your project. You’ll get to touch the area rugs and upholstery fabrics we’ve selected, and see the details up close and personal. After all, we want you to be as excited about your new space as we are! Once we receive a deposit during the presentation step, we’ll get started placing orders as quickly as possible, to avoid watching our selections go out of stock. We’ll keep you updated on estimated lead times, and take care of returns or repairs on any items that may come in damaged. It’s during this phase that we will also get to work on coordinating the contractors. Once construction begins, we’ll ensure that your contractor implements our drawings and specification sheets accurately, for a smooth remodel process. After all construction-based phases of the project are wrapped up, we’ll bring in a cleaning crew to tidy up your home before we start bring in furniture. Providing that all of your new furniture and decor has arrived at our warehouse, we’ll set a date and come to your home to deliver and install it for you. Our team will also accessorize and style your home to complete the look and make it picture perfect! Yay! Your design project is done, and it’s beautiful! The only thing left is for us to make absolutely sure that all of the boxes on our list were ticked off efficiently and completed beautifully. We’ll walk through the finished project with you, and if anything is not quite right, we’ll come up with a plan to get it resolved as quickly as possible. Once you’re satisfied, we’ll wrap up any outstanding invoices and then it’s time to enjoy your completed space! We hope that you find this helpful and that it answered any questions you may have about what it’s like working with a designer. If you have any more questions, please feel free to contact us at contact@rwarddesign.com or (916) 668-9590. 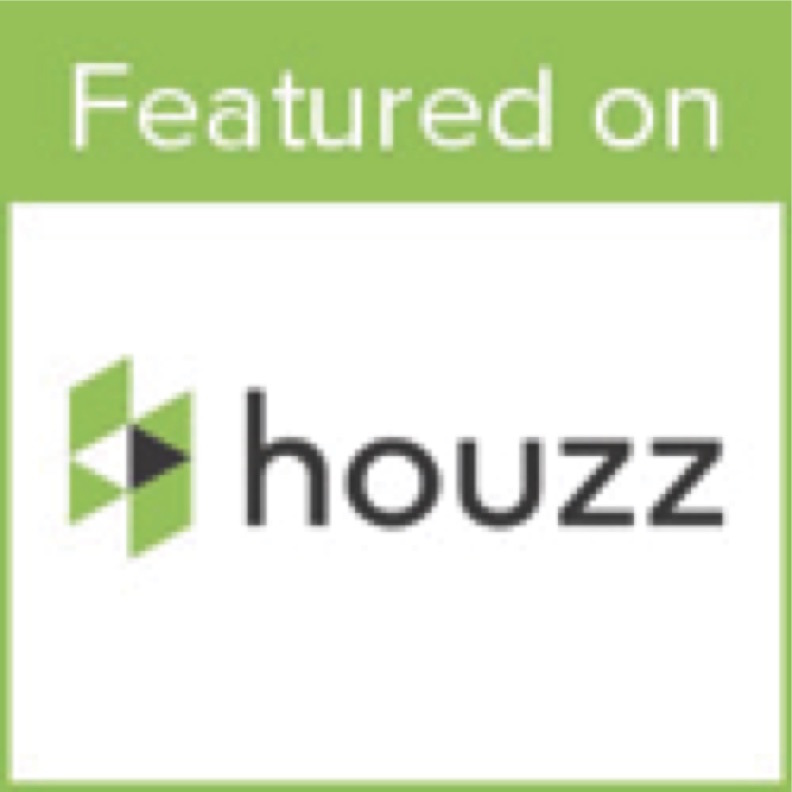 If you’re ready to start a project, click here! Flowers are blooming, birds are chirping, and the strange urge to deep clean the house has crept over us, which can only mean one thing: Spring has officially arrived! Spring is one of our favorite seasons because it is such a happy-making time of year. Everything feels fresh and beautiful, and of course we want to bring it into our homes. 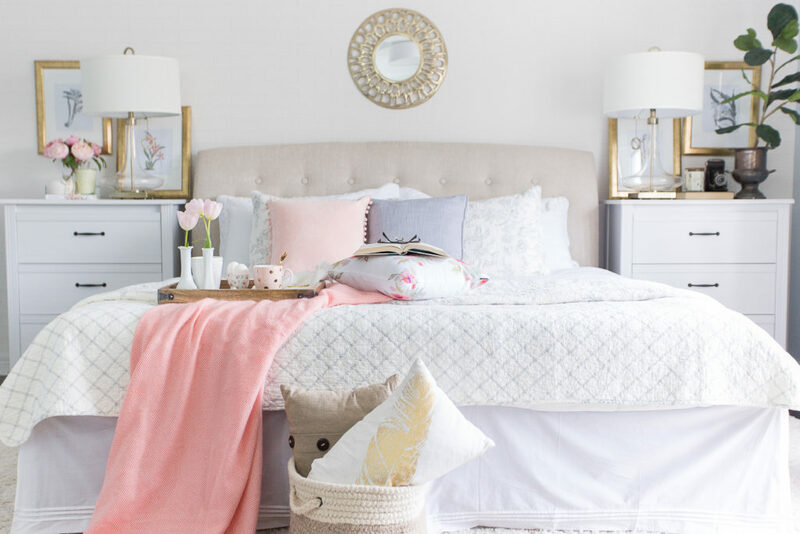 Adding pastel pillows and throws to your bed, couches, and chairs is a super easy way to welcome this season! The pops of color evoke thoughts of blooms and sunshine. Pick colors that go with the color scheme of your home. If pink and purple aren’t your thing, try pale blue and yellow… or even just light neutrals if that’s what works best in your space. 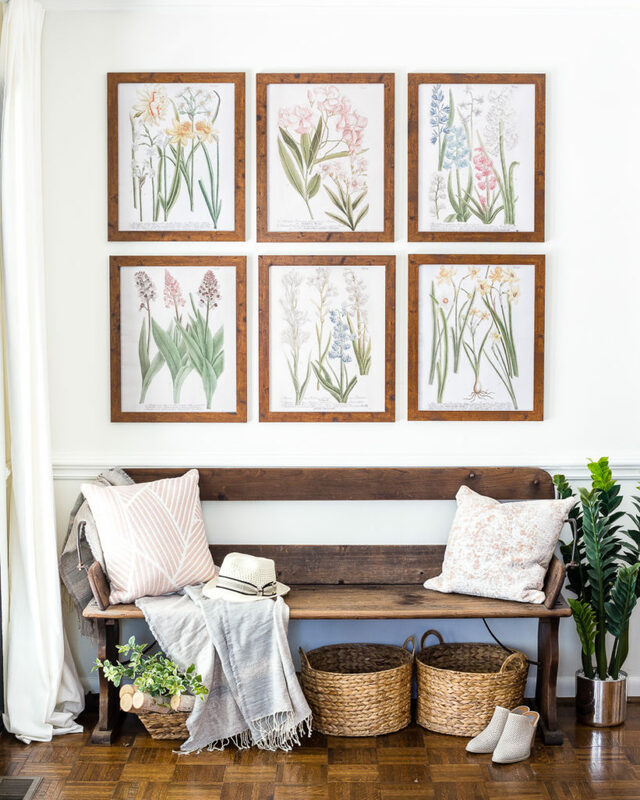 Another easy Spring fix: switch out some of the art in the frames already on your walls for some Spring floras! The holes are already in your walls, might as well use them in a new and pretty way. 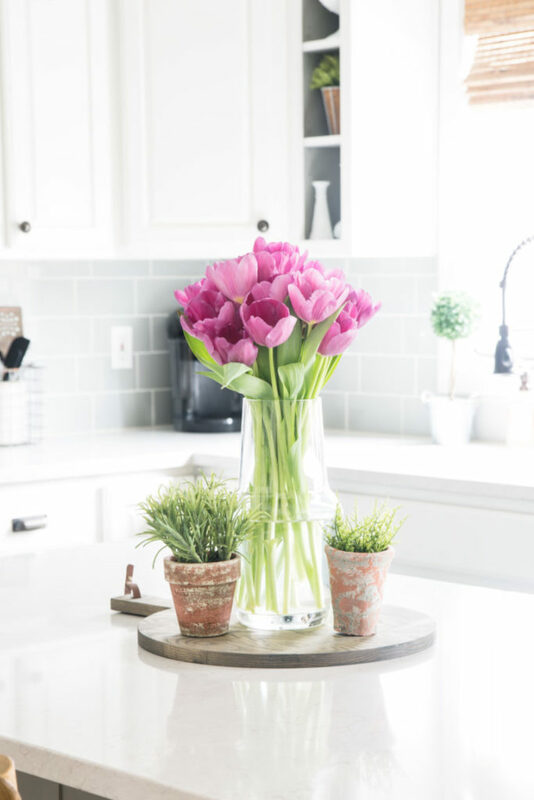 Swapping out the decor items you already have in your home with Spring decor is, again, really easy and effective. Mix greenery (it’s ok if it’s fake! ), terrariums, flowers, and Spring art into your existing accessories. 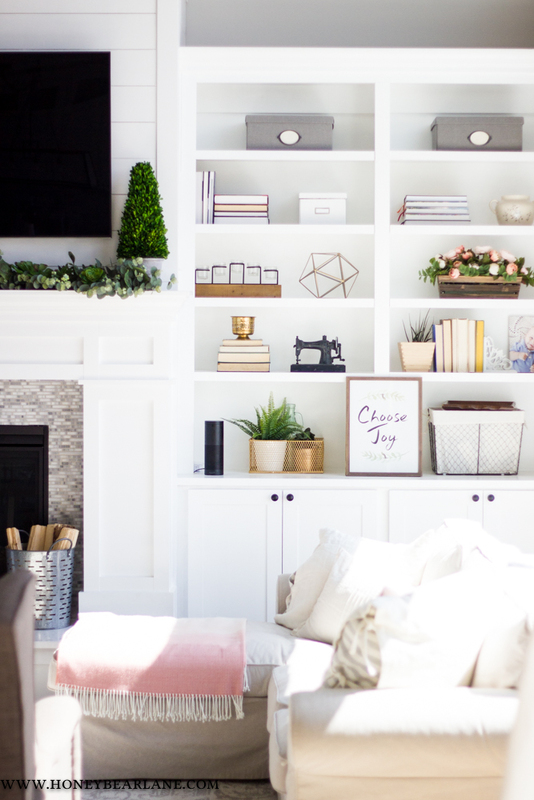 This means bookshelves, coffee table and other table tops, your mantel, and consoles can all have Springy decor items added to them, bringing you joy everywhere in your home! Whether you try one or all of these suggestions, you home is bound to come back to life after the long and cold Winter. Comment pictures of your Spring decorating; we would love to see! Happy Decorating! Paint, paint, paint… oh we love paint. It can make such a HUGE difference in a space. The color we paint on our walls surround us and everything in our home, so obviously it’s important to make sure that it’s the perfect color. We often have clients who recently moved to a new home, and once they have all of their furniture in, they feel like nothing looks right. When this happens, we always suggest that they start by changing their paint. For instance, the existing paint in their new home might be a warmer tone than the paint in their old home, which can completely throw off the look! You’d be amazed by how different your space can look, just by changing your paint. Ok, so clearly paint is important, but how do you choose a paint color? Well, truth be told, that can be pretty tricky. There are thousands of paint colors out there, especially when you consider all the different brands of paint. Each brand has slightly different colors and color names, and each company has different sheen level options available. And then sometimes a color looks good on the swatch and then you put it on your wall and for some reason it looks more vibrant than you thought, or it looks purple and now your sofa looks weird… oh no, what’s going on!?! Don’t worry. Everything will be ok. The sheen level, or “shininess” of your paint can not only change the look of the paint, but also the clean-ability. Therefore, the sheen should change depending on the room you’re in and what kind of surface it’s on. For example, you’d want a more cleanable paint in the kitchen or bathroom where water, food or makeup are more likely to get on the walls. Plus, your baseboards should have a higher sheen than your walls because they’ll need to be cleaned more often than the walls. Ceilings, on the other hand, should have less sheen than your walls because they won’t (or shouldn’t) have to be cleaned as often as your walls, etc. In general, we believe that ceilings and trim should be white, or a whiter shade than your walls. There are exceptions to this, of course, but as a general rule, we think this is pretty important. Painting the ceilings white can make a huge difference in a space. The lighter your ceilings are, the higher they’ll appear, so if your room always feel dark or oppressing, you can completely reverse that by lightening the ceilings! Having white trim also keeps your walls nice and… well, trim. Keeping door trim, window trim, molding, and baseboards all the same crisp color keeps the uniformity, and plus, it just looks nice. There are sooooo many shades of white to choose from, and each one has a different hue. The most famous shade of white is Swiss Coffee (which, by the way, varies from brand to brand), but that doesn’t mean it should be your default; consider other white options! Also, the white trim and ceiling rule still applies if your paint your walls white. If you choose a shade of white for your walls, choose an even more crisp or pure white for your trim and ceiling. It’s not often that we would recommend a pure white for all surfaces, so avoid that unless you’ve sought the advice of a professional (hint, that’s us)! Perhaps even more overwhelming than white paint, grey tones give pretty much all of our clients a run for their money. The trick to this area? Pay attention to the color wheel; colors that are opposite on the color wheel will highlight each other. So, for example, if your floor tile has a lot of yellow in it, you’ll want to avoid cooler grey tones, or your walls might look purple! Just a quick note here: sometimes painters will insist on only using one brand of paint. We typically use Dunn Edwards when we select paint colors for our clients, because most of our regular painters prefer it. But if your painter will only use a certain brand, make sure to let us know so that we can bring a paint deck for the brand your painter is using! 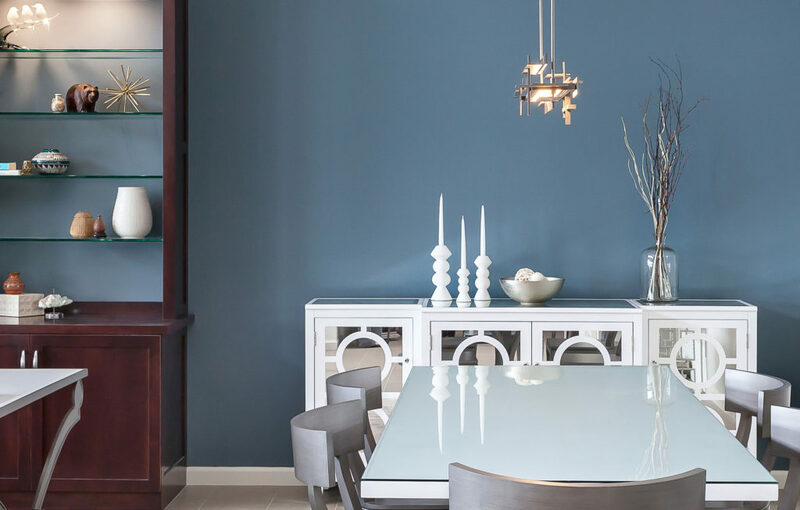 Need help choosing paint colors or an overall color palette for your home? Please contact us for a color consultation meeting! We would be happy to help you on your journey to a happier, more colorful life. 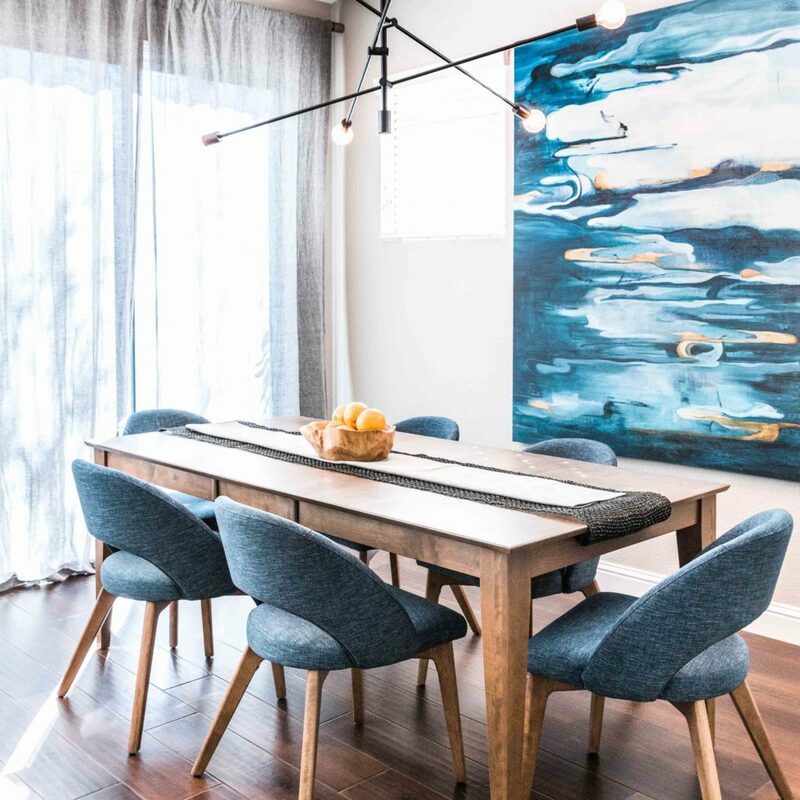 As the first month of the new year comes to a close, we are full of excitement and anticipation for the new design trends on the horizon in 2019. We predict that many of our favorite trends from last year are going to be sticking around (yay!). Here are the trends we think, and hope, will be following us through the next year. Mixed metals were seen as a no-no for a long time in the design world. However, recently mixed metals have become popular, and thank goodness for that! This trend grew in popularity due to brave designers who were willing to break away from the norm. 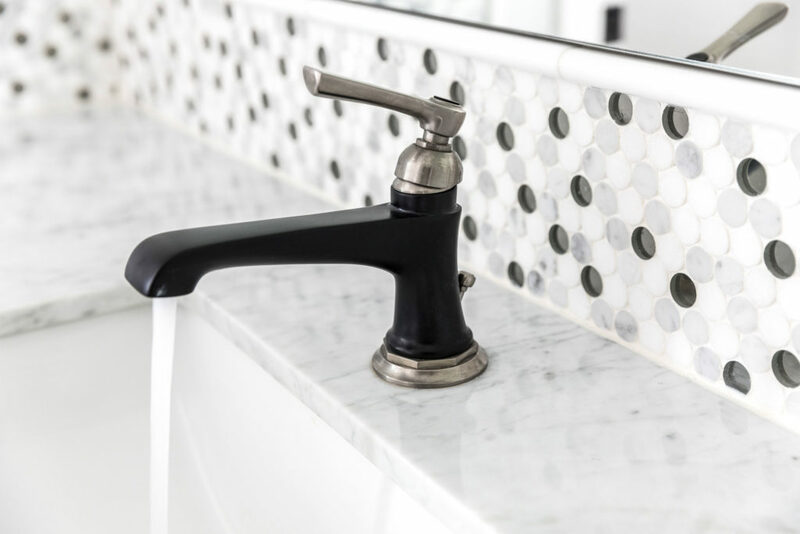 Now, it’s such a common trend that plumbing fixture manufactures have begun creating mixed metal fixtures (like the one from our Black & White Kitchen & Bath project, pictured above). When done well, mixing your metals can be freeing, fun, and beautiful. This trend has been around for a while and honestly, we hope it never leaves! 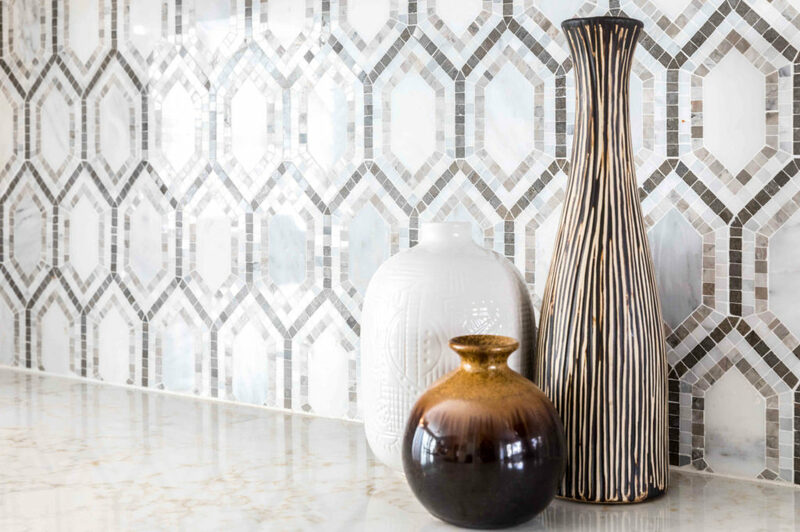 Statement mosaics never fail to wow, no matter where they are used, and there are so many different styles to choose from. The graphic, geometric tiles shown above from our Breezy Bachelor Pad project give the space a contemporary feel. However, if we’d chosen a scrolling floral mosaic instead, the style of the space would change completely. 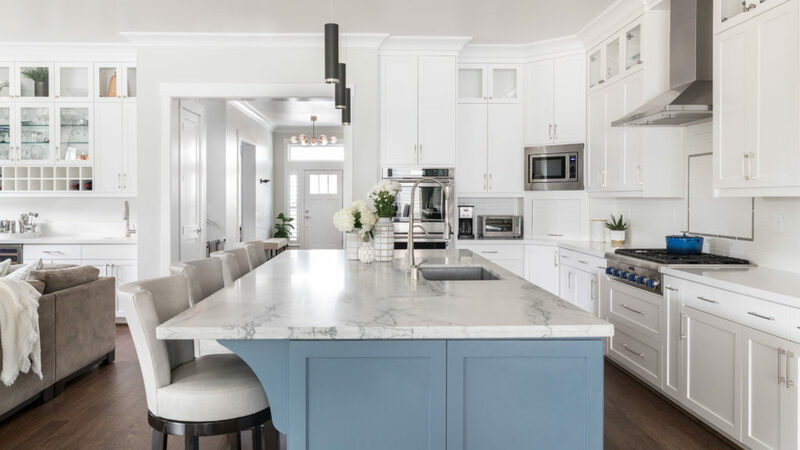 Colored cabinets have made a big splash in the design world recently, the most popular look being navy lower cabinets with white uppers. Blue toned cabinets in general have been very well received (just like in our Darling Davis Farmhouse project), but we’ve also seen many shades of green, teal, yellow, grey, and even some black! So fun! We looove a statement! And what better way to make a statement than with your walls. Whether it’s a gorgeous, un-expected paint color or a larger than life wallpaper, going bold is just plain fun! 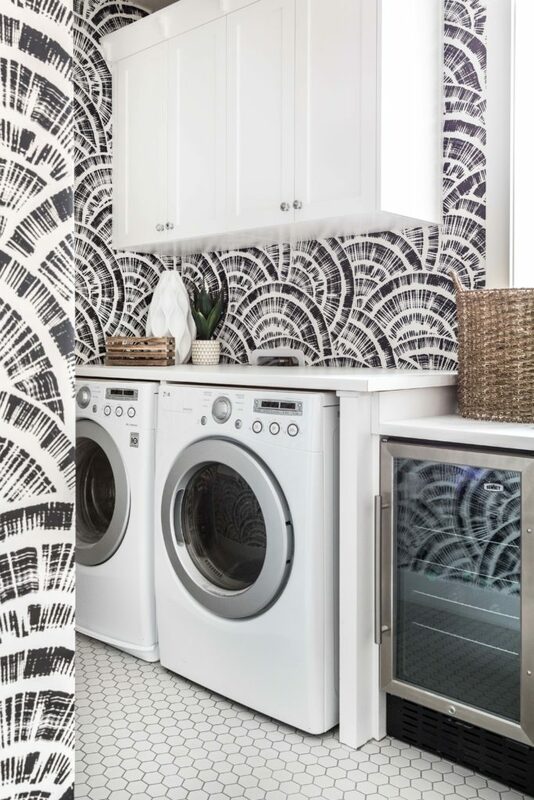 If having bold walls scares you a little, but you still want to be in on the fun, consider going bold in a smaller space, like a powder room or a laundry room (just like we did on our Darling Davis Farmhouse project). 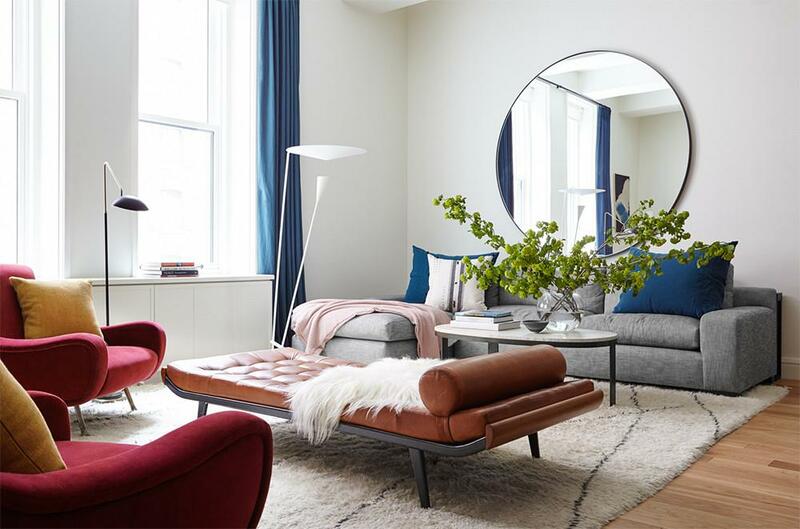 Round mirrors and blush accents were super popular last year, and will definitely continue to be well received this year! We have an over sized round mirror in our office, and we love it! We have also used blush to accessorize in many projects recently and it always looks amazing. The image above was designed by Consort Home and is a perfect example of trendy accessories. Trends are never static, always changing and shifting. We often have clients who express to us that they are worried about following a design trend, only for it to then change and become unfashionable. Our answer to them is, if you really love the look, you should go for it! If something becomes “un-trendy,” but it’s a look that brings you happiness, that’s all that really matters. Be brave and love that trend wholeheartedly!